Department stores don't usually sell wine in glass jars or have a genial local hanging around outside offering a shot of moonshine to anyone who looks thirsty - or brave - enough to try it. 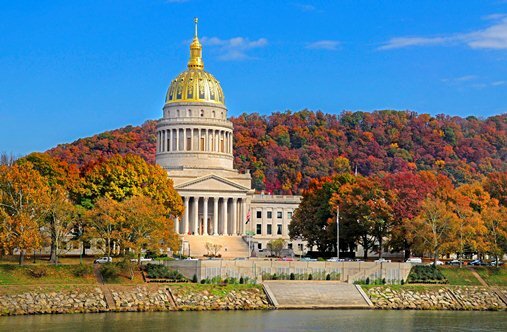 Welcome to West Virginia, a refreshing world away from America's mainstream tourist attractions and a literal breath of fresh air for anyone who has had their fill of fast food, theme parks and lookalike shopping malls. The only state to be born out the Civil War, and commemorating its 150th anniversary in 2013, the state is off the radar as far as visitors who want to do all things Disney are concerned. And whilst it's got a wealth of cultural trails and attractions for wartime history buffs it's not stuck in the past. The heritage that led to it breaking away from Virginia has resulted in a modern-day state stamped with individuality, creativity and more than a touch of eccentricity. With the eastern border a one-hour drive from the international airline gateway in Washington DC, or the option of a short internal hop to the capital city Charleston, it's easy to get there and get around and we opted for a week-long fly-drive. I spent the first night in Shepherdstown at the Thomas Shepherd Inn, a former parsonage that's now a B&B run by attentive hosts Jeanne Muir and Jim Ford. A restful antidote for anyone who has spent too much time in mirror image chain hotels, creaky floorboards lead to comfortable rooms decorated with hat boxes and other knick knacks. The lounge has tea, coffee, snacks and even a civilised nip or two of sherry on tap, and if you've never had apple soup you might just get it as part of Jeanne's wonderful home-cooked breakfast. In fact be prepared for more than an apple a day as the golden delicious apple is West Virginia's state fruit and one of many varieties grown there. Here you'll find apples served day round in pancakes, cakes, compotes, sauces and the ubiquitous pie, to name just a few, and in Berkeley Springs there's even an annual apple butter festival every October. Each February the historic and quirky spa town, where we spent the next morning, is also home to the world's largest water tasting festival, possibly more of an acquired taste. A great place for a girlie weekend (there are three times as many massage therapists as there are lawyers), you can take a dip in baths filled with the local spring water or take you pick from the host of day spas before you hit the shops. Try and catch a film at the Star Theatre, which screened its first movie in 1928 and was saved from closure in 1977 by local author and historian Jeanne Mozier who dispenses popcorn from an original 1940s machine. From cosy B&Bs to full-on luxury options, the state has a wide range of accommodation. One night we booked a 'log cabin' high in the Allegheny Mountains of Tucker in Blackwater Falls State Park. The reality was an incredible wooden des res packed with everything including the kitchen sink. The only problem was we hadn't been shopping, so spent the evening in nearby Thomas, which turned out to be a good move. Tip Top, on the main street, is typical of the many restaurants owned by passionate individuals who eschew cheap burgers in favour of organic meat and produce and all-round great foods. Cool staff, kitted out in check caps and waistcoats, bustled round as a duo played Appalachian music, influenced by Africans, Europeans and other early immigrants. We opted for a set dinner, served with vegetables picked that morning, for $19.95 and leafed through the wine list in a ring-bound folder before opting to go for the meal paired with different wines for $34.95. Afterwards we followed the sound of music a few doors down to the Purple Fiddle, a live music venue in the former store that doubles up as a coffee shop, deli and community showcase for local talent depending on the time of day. I declined the offer of moonshine in favour of some decent wine served up in a sturdy Mason jar and leaned on the old shop counter to listen to the band. Keep an eye out for local Smooth Ambler spirits on your travels. Joint founder John Little works on the philosophy "buy local, drink local" and the result is smooth drinking vodka, gin and whisky that you can also taste on weekly tours of the Greenbrier Valley distillery. A touch of Dutch courage would have been welcome on the morning we gingerly stepped onto the catwalk of the New River Gorge Bridge, the world's second longest steel arch span bridge after Shanghai. Some gentle joshing and coaxing from the gung-ho ex-Marine guide did the trick and before long before we are looking down at the view, along with a peregrine falcon perched nearby, from a height of 876ft - nearly three times the height of the Statue of Liberty to put it into perspective. An exhilarating experience, it was the literal high spot of the week. With feet firmly back on terra firma other highlights included an afternoon in Lewisburg, once voted the coolest small town in America where enterprising outlets include the Harmony Ridge Gallery, a wonderful place to find local hand-crafted jewellery and other arty souvenirs and cleverly combined with a wine bar. The week ended in Charleston, picking up last minute buys at Taylor Books, another visionary combo of a cafe, gallery and shop, run by Englishwoman Ann Saville, and visiting the Capitol Market, bursting with local fruit and veg, for lunch in Soho's, a converted warehouse on the market site and our reluctant last taste of West Virginia. You don't need a certain cartoon mouse to add a touch of magic to a holiday in this neck of the States. John Denver sang about it being "almost heaven" in Country Roads and I found plenty of natural highs in this beautiful region without needing a shot of moonshine.